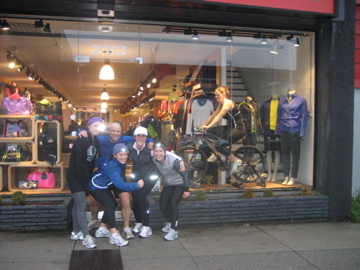 ~~~Run For One Planet Blog » Planet Runner’s is born! As I type these words I am awash in the warmth of a late November sunshine storm. Those of you living outside of Vancouver will be happy to know we broke two records for November! One was for least amount of sunshine hours and you guessed it, one was for total number of continuous days with rain. I believe the sun count was less than 24 hours and the rain days were more than 19 (in a row)! Needless to say, this moment of heat and light has everyone smiling (me included) and someone just walked by me, whistling a holiday carol! We are into the Christmas month as of yesterday, even though you’d think it had been Christmas since the day after Halloween, as most stores have been blasting our sense with holiday classics from Nat, Bing and Sting since the scary decorations went down and the Santa scenes went up! For us it is exciting times with continued speaking opportunities flowing “one opportunity at a time”. Like “small steps add up”, will always be relevant for everything we do. One presentation was last weekend, to close the Sun Run Leaders weekend with former Olympian Lynn Kanuka from Sport Med BC and her group of Sun Run leaders! Thanks to Lynn, for her energy and for the opportunity to reach more with our story! As I’ve intimated in previous blogs and the Planet Action newsletter last week, we are so close to launching what we’ve feverishly been creating with our Executive Board in our desire to keep “Action alive and running” within our community, across Canada and beyond! 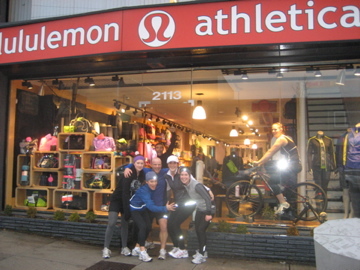 Yesterday marked the very first session with our community partner, lululemon and a most amazing, energetic and ready to run group of folks from West 4th Ave here in Kits. After a chat about the tour’s Top 10 Action Steps, each person chose which tip they were committing to for the month and we were off running (in the rain), talking about all things Planet and how our daily single actions affect her health both negatively and positively. The lulu edition of “Planet Runners” was born and next month we’ll meet again and we’ll all choose another habit to change from our website’s Top 10 and we’ll keep running, committing and building community one Planet Runner club at a time!!! Hey, we gotta be mysterious sometime. Run strong, healthy and make one small change at a time, for today and our children’s future tomorrow. Thanks for your enthusiastic presentation today at the Sun Run Leaders workshop. It was nice to see you after having read your blogs for the past year. Hi im 12 years old and i live in the UK and hi matt!! im a big fan of yours i watch storm hawks and monster buster club so great job! I would like to join in i might come to vancouver sometime and do it. and a little tip for you dont give up! !